NIAGARA — They’re there 24 hours a day, 365 days a year, administering medication, making patients who have to use bedpans realize there’s nothing to be ashamed of, being the face that anxious loved ones recognize, or simply holding the hand of someone taking their last breath. The hundreds of nurses at the Niagara Health System (NHS), Hotel Dieu Shaver Rehabilitation Centre and West Lincoln Memorial Hospital carry out their duties expecting no accolades. But for one week each year, their enduring commitment to health care and to the patients they make such an impact on falls under a spotlight. Nursing Week, running from May 11-15, is designed to publicize the key role that nurses play for patients and their families, from the moment patients are admitted to the minute they walk out the door. Carol Bergeron, vice-president of clinical services at the Shaver, said people who are drawn to a career in nursing have a burning desire to help others. Going to work is much more than just a job, she said. 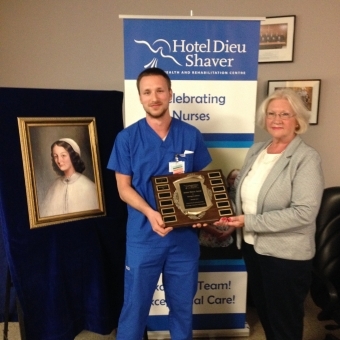 For the second year in a row, the Shaver presented an award named after Jeanne Mance, a pioneer in Canadian nursing in the 17th century. The award, with nominees nominated by their fellow nurses, is given to a nurse who exemplifies excellence in patient care and who contributes to the image of nursing. This year’s winner was Blake Gabamonte of St. Catharines, who joined the Shaver just a year and a half ago after getting his degree at York University. Gabamonte said his reason for pursuing a career in nursing was simple. “It’s all about caring for people,” he said. “Making a positive impact on people’s lives is my goal. Nursing staff at the Shaver are also holding a week-long campaign to benefit Community Care of St. Catharines-Thorold, holding bake sales with home-made goodies, a penny sale, purse sale and donation bins.